New Mexico's David Gualdarama of Kamehameha, above, and SMU's Duke Hashimoto of Iolani were starters for the Honolulu Bulls soccer team for four years. DAVID GUALDARAMA is about to savor a weekend that most college soccer players only dream about. 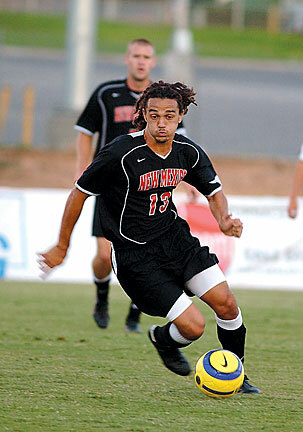 He is a starting midfielder for the New Mexico Lobos, who have reached the final weekend of the NCAA Division I men's soccer tournament -- the College Cup at Cary, N.C. The only thing that would be better is to return to the Albuquerque, N.M., campus Monday as national champions. And, the same is true for Iolani's Duke Hashimoto, a starting striker for the Southern Methodist Mustangs. This is the first time two Hawaii players have reached the men's College Cup, and they could face each other if their teams win tomorrow. The semifinal-round matchups tomorrow have the Lobos (17-1-3) playing Clemson (15-5-3) and SMU (14-5-3) taking on top-seeded Maryland (18-4-1). The winners meet Sunday in the championship match. "It's really intense right now, trying to get school and final exams (that begin Saturday) moved back and soccer practice," said Gualdarama, a sophomore from Kamehameha. "It's exciting, but kind of overwhelming. The professors have been real good and everything is pushed back." The No. 2-ranked Lobos had a first-round bye, then won three consecutive overtime matches at home. Last Friday, they beat California 1-0 before a sellout crowd of 5,600 at the New Mexico Soccer Complex. "All our home games have really big crowds. There is a lot of yelling and it makes me kind of nervous at times," said Gualdarama, a four-time Interscholastic League of Honolulu all-star. "You are playing in front of a lot of people in the community who we see all the time. We are very active in the community, visiting hospitals, things like that. When you play in front of them, you want good results." David Gualdarama is a graduate of Kamehameha Schools, where he was a four-time Interscholastic League of Honolulu All-Star. GUALDARAMA RECEIVED numerous recruiting letters and talked with several coaches, but UNM's Jeremy Fishbein was the most persistent and had the best sales pitch. Gualdarama's only recruiting trip was to Albuquerque. 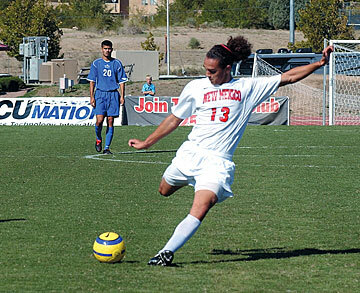 He played in 19 of the Lobos' 20 matches as a freshman and went through a transition period. "You come in and it takes a whack at your confidence. You are with big-time players. Everyone is quicker and faster. I just felt more comfortable as the season went on," said Gualdarama. Last summer, he spent three weeks playing for the Puerto Rican under-20 team. He was eligible because his father (David), who was born in Honolulu, is of Puerto Rican descent. "We went to the Dominican Republic for a tournament and to host another tournament," said Gualdarama. "It was a really different area to be in. We had a lot of free time and a lot of fun." He began this year as a starting center midfielder in Fishbein's 4-4-2 system. "David is a creative player, more offensive than defensive but he has to play both sides of the ball," said Fishbein. "He has grown as an individual and as a soccer player. It has been a process, but he is doing well. His strength is his athleticism and his technical ability." Gualdarama was sidelined for three matches earlier this year when he suffered a deep charley horse in his left thigh during a scrimmage. "I was making a run and played the ball, then got hit. It was kind of a freak accident," Gualdarama said. He has two assists this year but is waiting for that first goal. "I've had chances (seven of 13 shots on goal this year). I'm hoping to get one in the final four, at least," he said. GUALDARAMA AND Hashimoto were opponents for two ILH seasons and teammates for four years with the Honolulu Bulls. They were starters on the Bulls' team that won the McGuire Cup Youth National Championship in 2004. "I was just talking to a friend about how long I've known David. I heard about him when we were playing AYSO. We played together in indoor leagues and for Leeward Soccer Club," said Hashimoto. "Right now we're just focusing on Maryland. Our goal is to win a national championship. A lot of teams get hurt when they look past an opponent. We're taking one game at a time." Hashimoto has scored a goal in every NCAA match for SMU. Last Saturday in a 3-2 double overtime win against North Carolina, he assisted on the first goal by Bruno Guarda at 39:09, then scored at 51:40 on an 8-yard shot off a through pass from Guarda. Hashimoto leads the Mustangs in scoring with 11 goals and seven assists. "I think I'm playing the best I have for SMU. A lot of it has to do with my teammates. We open things up for each other," said Hashimoto. He also has been selected to participate in the 2006 adidas Major League Soccer Player Combine that will be held at The Home Depot Center in Carson, Calif., from January 12-15, 2006. Hashimoto confirmed Tuesday he will attend.